There are few events in the sport of track and field that people understand like the mile. Even people who know very little about track, know that it takes an extraordinary effort to break four minutes over the 1,609-metre race. The mystery surrounding this distance is as alive today as it was in 1954 when Roger Banister first broke the magical four-minute barrier. Sixty four years after Bannister, as a naive 18-year-old high school senior, I found myself dreaming of this feat. Only six high school runners in North America had ever broken the four-minute mile barrier, and it wasn’t that long since pundits finally stopped saying the four-minute mile was not humanly possible. But hey, I’m young, and frankly, I don’t know any better. I knew I wanted to give this a go and see if I could become only the seventh high school athlete in North America to dip under four minutes. The race was set. I was going to give it a shot at the Aileen Meagher Track Classic in Halifax. No athlete had ever broken the four-minute mile on Nova Scotian soil, so what better place to try? I woke up to far-from-ideal weather for the record attempt. In true Halifax fashion, it was windy and rainy, great racing conditions … or not. As the day went on, I watched the weather beginning to break and the sun slowly peaking out. Was it going to be possible? Might I get the ideal weather conditions and a good opportunity to break four minutes? I remember walking into the stadium like it was yesterday. I had flown from Ontario to Nova Scotia to race in a big International competition. I was young, excited and ready to compete in front of a large crowd. What I wasn’t expecting was the stadium to be empty and the race organizers still setting up the timing system and getting things underway. I thought to myself, this is exactly the place to break the four-minute barrier: low key, small crowd, but at the same time, everyone knew what we were trying to accomplish. As we approached race time, conditions weren’t perfect, but they were as good as you could expect in Halifax at that time of the year. The race was on. It could be a record setting night, or at least I hoped so. At this point, the only thing I could do was try to relax and get the nerves to settle down. My body knew it was about to go into battle and I would be pushing it harder than I had ever done previously. I knew I was ready, but there were still those questions in the back of my head: was it possible, was I really ready, and did I train hard enough to do it? I didn’t want to let everyone down who came to watch me. The gun goes off and immediately I tuck behind my two pacemakers, Darryl Fillion and Matt Kerr. Darryl has the task of taking us through the first 800 metres in 1:58 and 2:27-2:28 at the 1,000 mark before Matt takes over for the next 200 to get me to bell lap. We go through the first two laps and I hear the meet director yell out “1:56!”I would be lying if I didn’t admit an explicit word popped into my head when I heard how fast we were. The excitement of the night made us go out a little too quickly, and I still had half the race to run. Darryl adjusted somehow and he was right on pace through 1,000 metres. It was now time for Matt to get me to the bell lap, and then finally for me take over for the last 400-journey solo. At the bell, Matt moved to the outside of Lane 1, and I slid into the lead and started pushing. I needed a 59-second final lap to get under four minutes. As we moved around the bend, with 350 metres to go, I could hear Matt slowly falling off. The hope was, he could push me all the way to the end but at this point, it was up to me and me alone. “Come on Nate, keep pushing! Go!” I could hear the screams coming from the line of people on the infield. I could have sworn there were thousands cheering me on by the noise they were making. Really, there were at most 60 or 70 people. I came around the far straight, less than 200 metres to go, and knew I was still on pace, but my body was also starting to break down and fatigue. “Just hold on, Nate,” I thought to myself. Coming down the homestretch, I could see the clock ticking, 3:53, 3:54, 3:55 … I did everything I could to maintain composure and get across the line just as the clocked ticked past 3:59. As I type this, my heart has been beating faster, just thinking about that race and the excitement of that night. To this day, I still get excited and nervous just thinking about that night in Halifax. From an 18-year-old senior at Preston High School in Cambridge, Ont., to competing in three Olympic Games, a dream has come true. My career has taken me all over the world. But to this day, only 1,497 humans have ever broken four minutes in the mile, compared to 4,638 who have summited Mount Everest during the same decades. 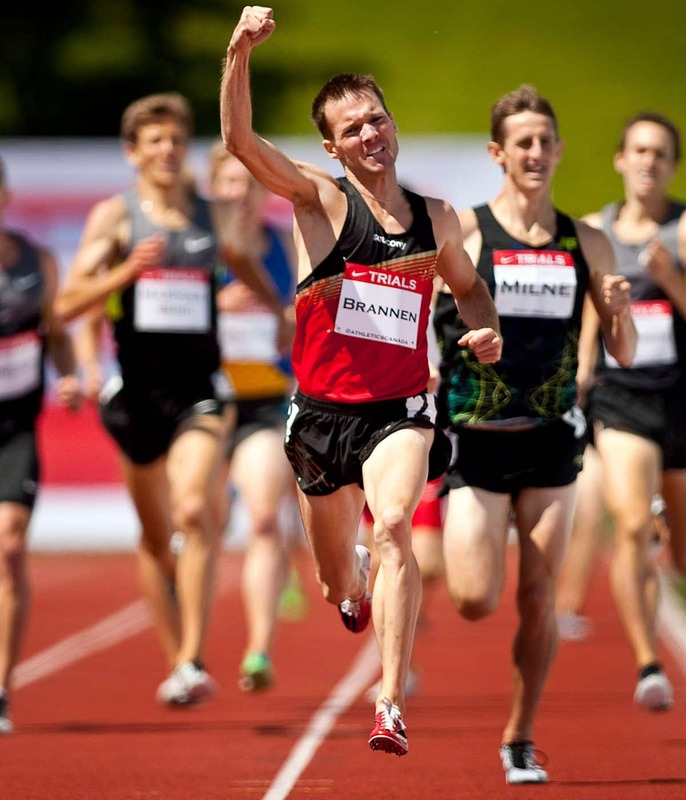 Over the 19-plus years since I made my first Canadian national team at 16 years old, it was races like that pivotal sub four that kept me going. I honestly don’t know how many times I’ve broken four minutes during my career, but one thing I can say for certain is that I will never forget the first one. As big a night as that was in Halifax in 2001, what kept me going for so long was always wanting more. I was never satisfied with breaking four minutes, or making the national team. I always wanted to see just how well this boy from Cambridge, Ont., could do against the best in the world. At a very young age, I remember dreaming about being in the Olympics. Looking back now, it’s apparent that I knew something more than I realized back then. There was something in me, a drive I couldn’t hold back. My dream of making the Olympic Games first came true in 2008, when I qualified for Beijing in the 1,500. But just qualifying wasn’t enough. After finishing 15th at those Games, I knew I wanted more, and the drive to improve kept the fire going through my entire career. There were many times when I thought about hanging them up and moving on. Many serious injuries that could have ended my career, but somehow I came back from each of them, just wanting more. I think the main thing that kept me going was the fact that I truly loved what I did and loved competing. That magic night in Halifax might have been the fire that started a career of nearly two decades. Now that I’m newly retired, I still feel the desire to get back out there and compete, but I’ll leave that to the young guys and enjoy watching from the sidelines. A: Sub 4 by Chris Leer. A: Wish I had more time to actually listen to Podcasts. A: I do real estate flipping. A: LeBron James, Wayne Gretzky, Doug Gilmour, Gene Simmons, Robin Williams, Tom Hanks. A: Sappy clips of dads with their baby girls. A: Be an amazing dad to my 2 awesome kids.